A March 29 meeting between Azerbaijan’s President Ilham Aliyev and Armenia’s Prime Minister Nikol Pashinyan was billed as among the most positive in recent years, but it was overshadowed almost immediately by the aggressive rhetoric of subordinate officials on both sides. Present-day Azerbaijan’s borders are a product of the Turkmanchay Treaty between Tsarist Russia and the Persian Empire that divided the country along the Arax River in 1928. As a result, the number of Azeris in Iran far outnumber those in the Republic of Azerbaijan that has a population of 10 million people. Presently there is no official data available on the number of this country’s Azeri population. But the Encyclopedia of the Stateless Nations (2002) put the number of Azeris in Iran at 18,500,000 people, or over a quarter of Iran’s population. In Azerbaijan, many criticise Iran for having friendly ties and cooperating with Armenia, while Tehran, in turn, is wary of Baku’s economic and military partnership with Israel. Although close religious and cultural ties bind Iranians and Azeris — they mostly share Shia Islam as a faith — Azerbaijan’s government is strongly secular and suspicious of Iran’s potential influence over conservatives in the Caucasus country. 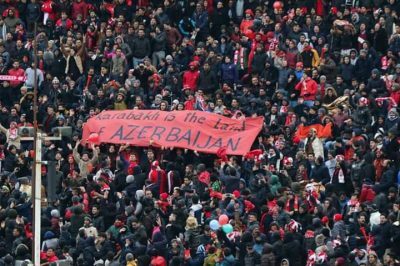 Anger over the disputed territory was on full display during Pashinyan’s visit to Tehran at the end of February that culminated in a number of protests, mainly by fans of Tractor Sazi Tabriz FC, a football club based in the Azeri-populated northern Iranian city of Tabriz that has become a hub for Azeri activism in recent years. Many Azeris perceived Pashinyan’s visit as a betrayal. Compounding this discontent was the fact that a poster that read “Karabakh is Armenia. Period” was raised during Pashinyan’s meeting with Armenian diaspora representatives. The scandal over Pashinyan’s visit also reached Iran’s legislature where an ethnic Azeri MP from Iran’s Azeri-populated Urmia (Ormiyeh) region, Ruhulla Hazratopour, reiterated complaints over timing and called for Iran to clarify its position on Karabakh at a March 17 session. 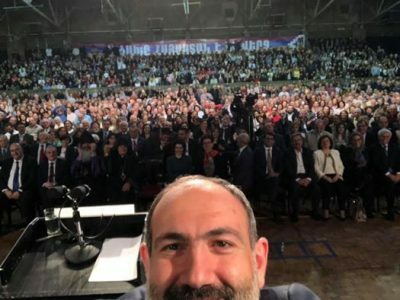 Typically, opposition to the Pashinyan visit was amplified on Facebook. One Facebook page used by Iranian Azeri activists is Gunay Azerbaycan (Southern Azerbaijan), which has around 20,000 followers. On March 3 the page carried a photo from Pashinyan’s meeting with Iranian President Hassan Rouhani accompanied by graphic footage from the Khojaly massacre, where women and children were among more than 600 killed by Armenian troops, according to Azerbaijani authorities.